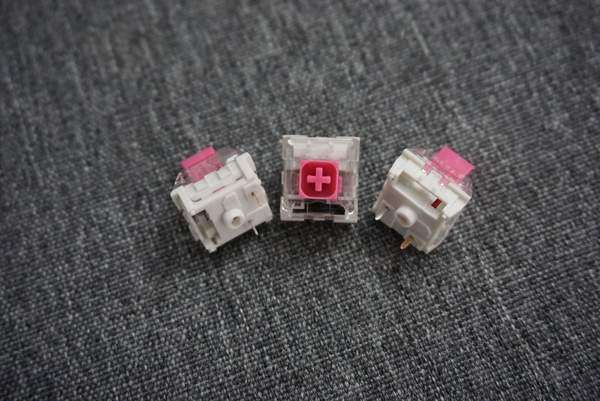 Haven’t seen them discussed here yet, they seem like pretty much my ideal clicky switch, as I couldn’t make up my mind on whether I wanted BOX whites or jades. Anyway, I was wondering if anybody knows whether other vendors will also be stocking these (like the previous thicc clicks) or is this an exclusive NovelKeys thing? If possible I’d like to get them thru an EU vendor so I don’t get hit with taxes and customs, or perhaps even thru KBDfans and take advantage of their assembly service. I am waiting on some of these to come in. Box Jades are one of my favorite switches, so I am looking forward to seeing how these compare. I already have a rebuild lined up for them. I actually just ordered some yesterday, so im looking forward to checking these out. I have boards with whites and jades so im ready to compare with each of those already. I didnt even hear much about these before they were even on sale, they just sort of appeared on NovelKeys lol. Got mine today. Very subtle changes to previous box clicky switches. First and foremost, the biggest difference is actually the SOUND. They sound a lot better. The higher, chirpy noise of the normal click bar seems to have been significantly reduced. I don’t know if it’s just the bar thickness or if there is lube somewhere new or what, but it’s a better sound, especially on the upstroke click. I did notice that the top housing is different from previous box clicky switches. This new housing has a cutout for in-switch LEDs, similar to the non-box kailh switches. The spring weight sits somewhere between the box heavy pale blue and the box white. At first, I didn’t feel any difference in the new, medium click bar from the old one in heavy pale blues and whites, but it is indeed slightly more tactile. It is nothing in the ballpark in stiffness of the bar in the jades or navies, however. I would say that these are an improved box pale blue. A touch more tactile, a touch less heavy, a better sound signature. For me, these are the best box click switches to date. However, and this is a big however, I am NOT a fan of box jades or box navies at all. So, if you like the heavier, big tactile punch of the thick click switches, I would advise against the new box pink. We’re really getting close to the sound of white alps with these switches now. Closer to the tactility as well, but still a bit off. Too bad that USPS does not deliver on Sundays… Have to wait until next Monday for mine to arrive. Be thankful you don’t live in Canada when it comes to shipping! I just ordered some myself. This will actually be my first custom clicky board. So I got mine over the weekend and put them in my Kira since it’s hotswap and the board i want to add them too won’t be ready for a while. So far I am really liking the switches and this is the first clicky switch that I enjoy typing on that doesn’t use a click jacket. I think the fact that it’s a heavier switch but doesn’t have the thick click bar really works well for this switch as you get the tactile even but it’s not overwhelming and the switch isn’t super loud so I can use this in at the office and not make everyone look angrily at me while I type. I have been using these for a week in a clueboard, and I like them quite a bit. I did notice some inconsistency with a small number of the switches I ordered; the click on 3-4 out of 70 seemed to be more muted. How do you feel they compare to box whites/jades/pale blues/navies in case you tried any of these? The description of them being between a box white and jade seems pretty accurate. They are more tactile than whites, and less click bar resistance than jades. I ordered from the US. I asked NovelKeys if they’re available anywhere in the EU, the answer was they’d be open to selling them anywhere, but haven’t been contacted by any vendors from the EU yet. WIll surely get bit by customs, but I suppose that’s the price you pay for being impatient. Cool, I was around there for a conference not too long ago, amazing country! I’m based in the UK, customs are hideous here and don’t even want to think what will happen after Brexit!